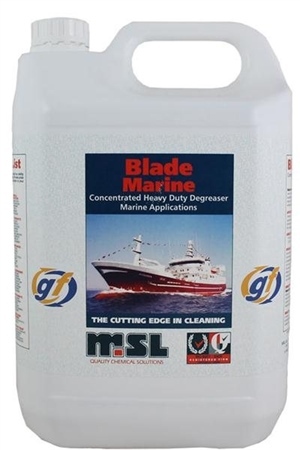 Blade Marine is a highly effective, environmentally friendly, concentrated water-based degreaser. Blades blend of fast-acting detergents and emulsifiers are fully biodegradable and easily remove heavy grease, engine oil, fish oil, scales, blood etc. from all types of hard surfaces without the need for laborious scrubbing and brushing. Applications Cleaning of decks, engine rooms, wheel houses, machinery, hull, superstructure etc. Removal or exhaust and soot stains, rain rust etc. Particularly suitable for pelagic fishing applications, fish boxes, crates, fish market and stance cleaning. Quay cleaning and landing sites. Areas of use Fishing boats, trawlers, wellboats, tankers, ferries, quays, piers, landing sites, fish markets and stances. Directions for use Blade Marine may be used neat or diluted with up to 200 pars of hot or cold water for extra economy. Spray, mop, dip or brush onto a surface to be cleaned. Allow activation time. Agitate the rinse or hose off with water.